This 1747 etching by Giuseppe Vasi shows the walls built by Pope Pius IV and Pope Pius V around the Vatican after 1562; a small gate was opened to allow the passage of the bricks needed by Fabbrica di S. Pietro (in Latin Fabrica Sancti Petri), the body in charge of building the new basilica and which today is responsible for its maintenance. Fabbrica is the Italian word for factory; the low building on the right side of the plate was a kiln where the bricks were made; they were marked with the letters A.U.FA. (ad usum Fabricae) in order to exempt them from duties. The view is taken from the green dot in the small 1748 map here below. 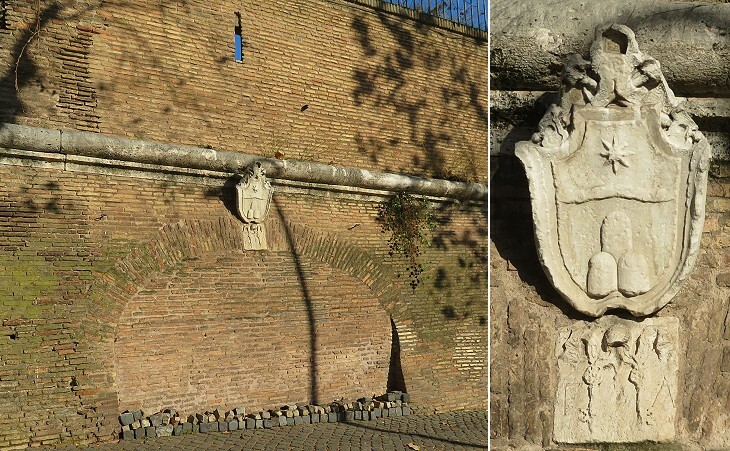 In the description below the plate Vasi made reference to: 1) Basilica Vaticana (S. Pietro); 2) Cupolino del Vignola; 3) Cavalry Barracks near Porta Cavalleggeri; 4) Hill of Sant'Onofrio. 1), 3) and 4) are covered in more detail in other pages. The map shows also 5) Porta Fabrica. Porta Fabrica was closed in 1870 when Pope Pius IX retired to the Vatican after the Italian troops had entered Rome. Because the ground was raised in order to build a modern road leading to new developments along Via Aurelia, today only its upper section is barely visible (red asterisk). The gate was not protected by towers or bastions and only a damaged coat of arms indicates its location. The plate shows one of the two small domes which were designed before the main dome. The construction of the new basilica started in 1506; in 1564 when Michelangelo died the four gigantic pillars and the drum they supported were completed; Jacopo Barozzi, known as il Vignola replaced Michelangelo as Head of Fabbrica di S. Pietro, but rather than working at the completion of the dome he preferred to concentrate on two small domes, as a sort of test for developing the appropriate construction technique for the main one. That on the southern side of the basilica was actually completed after the main dome as one can see in a 1593 Map of Rome by Antonio Tempesta. 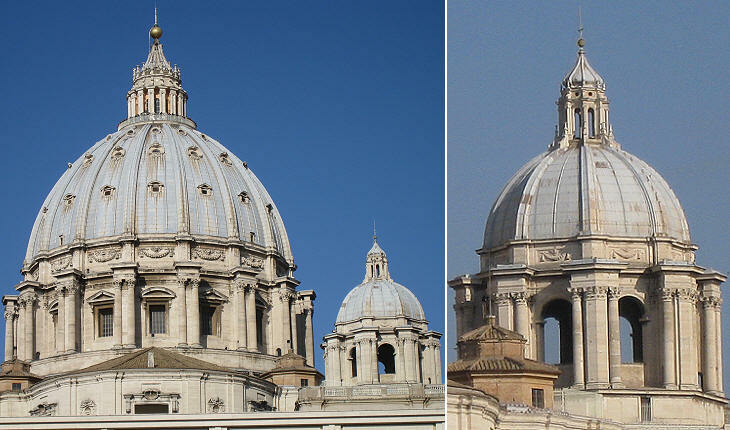 Michelangelo planned to use a round arch for the main dome and Vignola followed this approach in the design of the cupolini, whereas Giacomo Della Porta, who in 1589 completed the main dome, used a slightly pointed arch which enhances its vertical thrust. This is very evident when looking at them side by side. 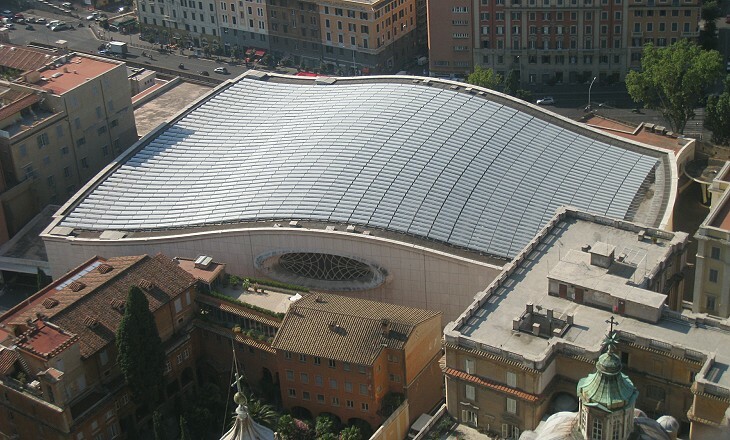 You may wish to learn more about the involvement of the popes in the construction of S. Pietro. 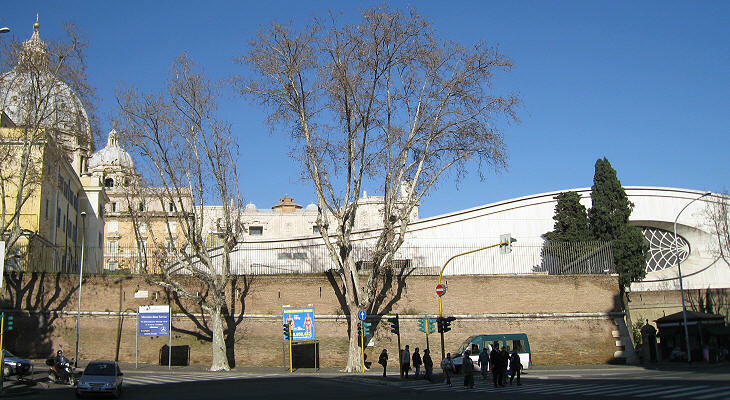 The street along the walls is very steep and it offers nice views over the main dome of S. Pietro and the stone pines of Rome. 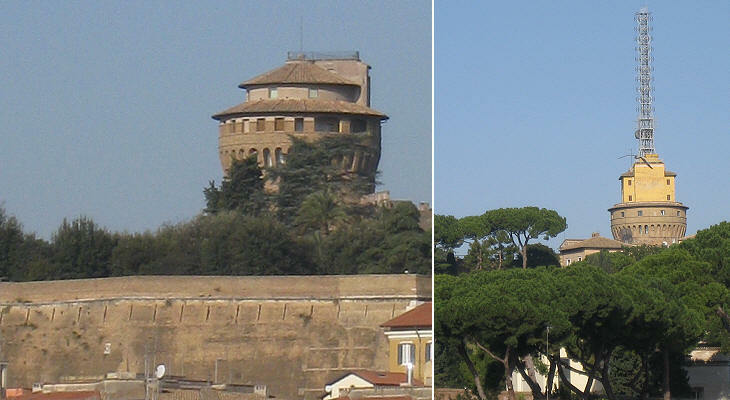 The XVIth century fortifications of the Vatican included two circular towers which can be seen behind this section of the walls; one of the towers was used in the early XXth century for radio broadcasting. Today Radio Vaticana is broadcasted from S. Maria di Galeria. 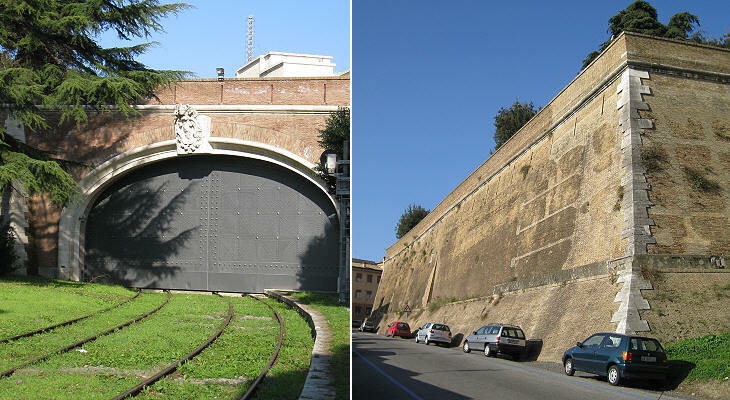 In 1929 an overall agreement (Patti Lateranensi) was reached between the Holy See and the Kingdom of Italy in order to settle the issues arising from the 1870 events; one of the provisions of the agreement established the construction of a short track to link the Vatican City State to the Italian railway net; a small station was built and the walls were opened at this location to allow the passage of trains. This line is very rarely used; on October 4, 1962 Pope John XXIII started from this station the first railway journey of a pope since 1870; he visited Loreto and Assisi. 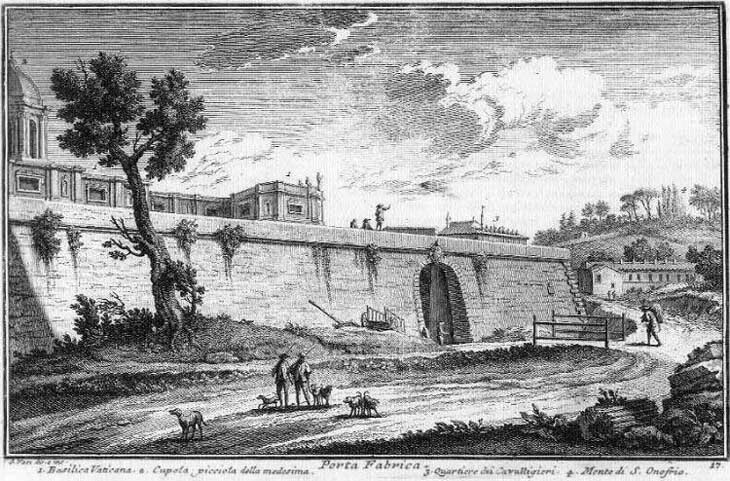 Next plate in Book 1: Porta Pertusa. Next step in Day 8 itinerary: Seminario di S. Pietro in Vaticano. Perchè in questa valle hanno trasportato i moderni Fornaciari la fabbrica de' mattoni, tegole, ed altre opere di creta, quivi fu aperta questa porta per comodo della fabbrica della città Leonina, e della Basilica Vaticana, donde ne prese il nome; perchè alle dette fornaci corrisponde, ed è più vicino alla Basilica.